Would you like to try different combination dish? Tender mutton with juicy cabbage!!! isn't sounds different ? Mutton taste good when cooked along with the vegetables, cabbage is one among the best combination. 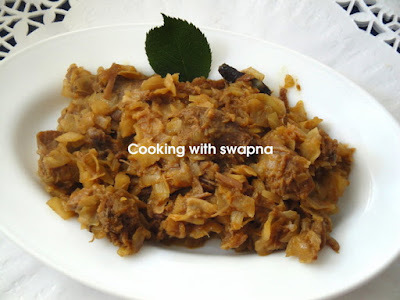 Cabbage is an exceptionally high source of vitamin C.
Mutton cabbage fry is just the way it is prepared in Indian homes. I prepare this dish during my regular weekends, which goes good with the rice (for my lunch) & chappathi (for the dinner). Clean the mutton thoroughly a few times under the running water. Cut the cabbage in chunks - Do not peel layers .Set aside. Heat the pressure cooker pan, add the oil, when its hot, add the cinnamon and cloves. Then add the onion and stir to avoid sticking to the bottom of the pan. Saute the onions about 5-10 minutes & add ginger garlic paste & saute until they are golden brown in color. Add the washed mutton pcs & combine well. Cook for 10 mins. Add turmeric powder & chilly powder & mix well. Add 1/2 cup water and salt and cook meat until tender. Add the chopped cabbage, mix well & simmer for few min till cabbage is cooked. Adjust the salt & garnish with corriander leaves if needed. 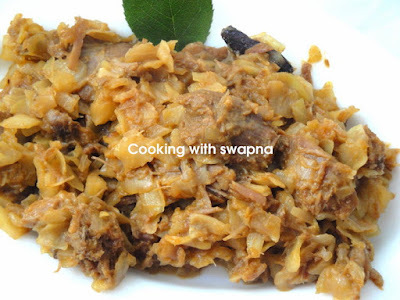 Enjoy the spicy mutton cabbage fry with rice or chappathi. I love cabbage in my food and so this recipe is one I will cook!